The National Round of the Philip C. Jessup Moot Court Competition is the most prestigious mooting competition in the country. The Team from Jindal Global Law School has achieved this distinction. The team comprises of Mohanakrishna C, Samhith Malladi, Nisha Raman and Sanjika Dang. The JGLS team won all the four preliminary rounds in the moot competition against prominent law schools from across the country. 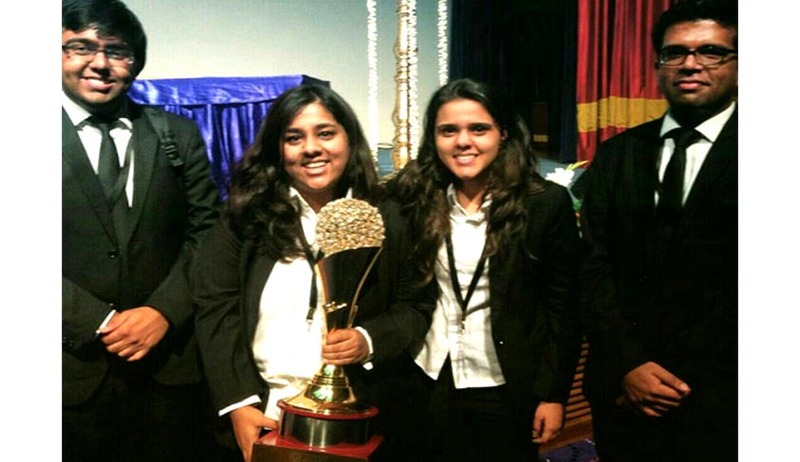 It then won the Semi-finals against National Law University, Jodhpur and the Finals against the NALSAR University of Law, Hyderabad. The bench for the final rounds of the competition was presided over by the former Chief Justice of India, Mr. Justice Altamas Kabir and other eminent jurists and academicians. Mohanakrishna C. was adjudged the BEST SPEAKER at the FINALS. The team will represent India in the WORLD CHAMPIONSHIP ROUNDS scheduled to take place in Washington D.C., USA this April. Samhith: It feels excellent, quite frankly. I had never approached this moot with the perspective of attaining the glory that surrounds it. I am an international law enthusiast, so my goal has always been to learn as much as possible through this moot. The opportunity to delve into the depths of the issue on the legality of the secessionist claim, which I was drafting, was the real reward. To see that hard work fructify into a big trophy was the icing on the cake. Nisha: It is a surreal feeling. It feels great to know that the sleepless nights, hardwork and teamwork paid off. Sanika: It is very overwhelming. We, as a team, just kept working hard without once discussing the results, and winning came as a welcome result of that hard work. Samhith: Sanjika and I were the winners of the NLS International Arbitration Moot 2014, Mohankrishna won the world rounds of the Oxford Price Media Law Moot and Nisha had won the ULC Bangalore moot in 2012, along with being a member of our previous Jessup team in 2013. The natural step for all of us was to participate in Jessup. We have all worked with each other in some capacity or another. Nisha: It was all about reading, each member knowing their responsibilities, and all of us knowing each other’s strengths and weaknesses. As for the team, all of us had worked with one another in some other moot or negotiation competition or were classmates, so we have known each other both personally or professionally for 3 years at least. That made us sure that we could work with each other. Sanika: Our college follows a specific procedure for selecting teams, where members of the society are ranked and allocated moots which they bid for. All of us were friends, and had been planning on doing Jessup together for a while before the actual bid. LiveLaw: What difference did you find in Philip C. Jessup Moot as compared to other National Moot competitions? Samhith: The Jessup sees participation from the best students from the best law schools across the competition. In terms of quality of participants, it is unparalleled. Additionally, the arguments are never obvious. There is immense scope for creativity, which makes researching the issues especially interesting. Nisha: The teams which come to the competition are the best from each college. The amount of preparation is unparallel to any other competition. That’s what makes the competition better than any other national or international moot competition. Sanika: Jessup was my first international moot, and personally I feel that there is almost nothing in common between national and international moots. The speaking styles required, the judges, and most importantly the time you devote to the moot are radically different. LiveLaw: How was it like working with the team? Were there any roadblocks? Samhith: I think this was the best moot team I have been a part of. Our strengths were our ability to identify narrow sub-issues within the broad issues given to us, research capabilities and our training as speakers in past moots (which allowed us to envision how an argument would like in an actual courtroom). The roadblocks were the obvious law school pressures - classes, assignments, electives and the like. We found it difficult to maintain a flow during the semester, as so many things would randomly crop up to keep us occupied. Nisha: It was great, we are a diverse set of individuals who have different points of view on the same thing. This was both an advantage and a difficulty (I wouldn’t term it as a disadvantage or roadblock). It was an advantage because it ensured that no point was missed and all perspectives were accounted for. It was a difficult because we would constantly get into arguments and spend hours trying to convince each other (which is also arguably a good thing). Sanika: I couldn’t have expected our team dynamic to be better. We were all friends before signing up for the moot, and Samhith and I have also done a moot together in the past. There are always roadblocks, but I think that working is always less taxing when you’re fond of the people you’re working with! LiveLaw: How many teams were you up against in the competition? Which team would you consider to be your toughest competition? Samhith: We were up against 4 teams in the preliminary rounds. Our toughest round was against NLU Jodhpur in the semi-finals. They were an excellent team and really well-practiced. The judges in that round were especially brutal and really stretched us to the limits. LiveLaw: What do you think got you success in finals? Who all chaired the Finals? Samhith: The knowledge that we had already qualified to the World Rounds in Washington really helped us remain calm in the finals. The President of the Court (ICJ) in the finals was the former Chief Justice of India, AltamasKabir. Nisha: Nothing in particular, we stuck to our plan and practice and ensured that we answered all the questions put forth calmly. We were not scared to admit at times that we were unaware of certain points, I think that was well noted by the bench that we didn’t bluff. The finals was chaired by Former CJI AltamisKabir, David Ambrose, Mr. Dixit, Ms. RozaPati, and Mr. Subramium. Sanika: I think that the finals are more about presentation than anything else. I think the speakers did a phenomenal job. LiveLaw: What is the most important thing that you learnt while preparing and doing the moot? Samhith: Patience. More than anything, frustration was the one emotion that I remember most vividly from our memorial preparation days. I guess I learned to just have blind faith in really tough times. Sanika: I am a very impatient worker, and Jessup taught me that at the end only patient work and faith can add positivity to otherwise very tedious months of work. LiveLaw: What was the hardest part while preparing for the moot? Samhith: Time management. The moot spans over the entire Fall semester, making it difficult to balance academics and our internal team deadlines. I even had to stop working on the moot for about two weeks because I was preparing for an interview with a law firm. Nisha: Secluding ourselves from civilization for the last 2 months to ensure complete focus on the moot and we did that (literally!). Sanika: Definitely the subject matter because our team was very understanding. There was a struggle on every step of the way, but we were expecting this from Jessup. LiveLaw: Did any one of you feel like giving up at any point of time and if so, how did you guys motivate each other? Samhith: Our philosophy was similar to the famous line from the Bollywood film '3 Idiots' - Aal is well. Nisha: Of course we felt like giving up at times, but at the end of it we all used to remind eachother of all the other sacrifices we have made to do this moot, be it giving up on free time with friends and family, or academics or great internships. So we new that we had to reach an end for all of that. Sanika: Personally, multiple times. I think all of us faced that once. At the end, I think the only thing that can pull one through that is genuine passion for mooting. All of thoroughly enjoyed the work, despite facing certain roadblocks. We would just remind each other of the bigger picture to keep working. LiveLaw: After the winning the National Rounds, would you be changing your preparation pattern for the final rounds? Samhith: Definitely. There is a distinct difference in how arguments are to be successfully presented in the international rounds. There will be more emphasis on our structure, diction, style of speaking etc. Mohan and I, as speakers, will have to adapt to speaking to longer periods of time at a stretch, as judges in the international rounds do not ask as many questions as Indian judges do. Nisha: No, it is just going to be reading a lot, as it has always been. Probably more oral practice than we had for our national rounds. Sanika: The focus shifts from written submissions to oral pleadings for the final rounds. The speaking style for Indians always needs a lot of work because of our heavy accents. Besides that, it takes a lot of more reading and meticulous research. LiveLaw: What role did your professor/ college play during your preparations? Samhith: They have been immensely supportive. Prof. Rehan Abeyratne placed great emphasis on meeting deadlines, which we failed to adhere to on many occasions, but it really kept us on our toes. A number of other professors gave us regular meetings, helping us narrow down essential concepts and arguments at an early stage. The University procured all the books we needed, which really helped us deepen our research and beef up the sources we cited. Nisha: The University has never failed to support us either logistically or financially for this moot. We have always been provided any resources requested for in terms of books etc. so it has been great. There have been professors who have guided us in our preparation so it has been great. Sanika: Our faculty and institutional framework generally is extremely helpful. They were always supportive of our work and offered help whenever we asked. LiveLaw: Has this moot changed your mind set about the area you would like to gain expertise in? Samhith: I don’t think any one of us moots with the perspective of building our career. All four of us enjoy working with each other and working on challenging problems. I personally enjoy studying different subjects and haven't really chosen a career path yet. Nisha: I definitely would like to specialize in Public International Law, that is the only reason I first got interested in Jessup. Sanika: I was generally skeptical of international law before I did Jessup, but the moot opened my mind up to the subject. As of now, I still hope to specialize in Arbitration. LiveLaw: How did you balance your academics and internship with the preparation of the moot? Samhith: All four of us gave up our winter internships to do this moot. That was a necessary sacrifice. As for academics, we momentarily stopped working on the moot a week before the exams and did what we could in the exams. Nisha: We try to pay attention in class, because we know that there would be no follow up reading done after class hours as that is dedicated to mooting. Our main study time for class work is right before the exam. Internships all of us have forgone just to dedicate to this moot. Sanika: We all gave up our internships for the moot, but had to balance our final exams with the preparation for the memo submission. Long-term time management goes a long way in keeping oneself organized during such times. LiveLaw: What do you plan to do after law school? Samhith: I have no idea whatsoever on what my plan after law school is. I've recently become drawn to the idea of an LLM in a sub-field of international law, but that's just a thought. Nisha: Pursue an LLM in International Law, and then possibly work for the United Nations or an International Law firm, but eventually get into academics. Sanika: I am still finding out! Whatever I do, I hope it’s fun. LiveLaw: What message would you like to give to the mooters and the non- mooters? What is your advice to someone who has never mooted before? Samhith: Enjoy the process. It is easier said than done, of course, but if you manage to relax and enjoy the subject matter then it becomes much easier to analyze and form arguments. It is also important to be really, really well-read. I often found myself immersed in the books I was reading, often on points that had no chance of ever becoming a relevant argument for me. But it helps build that context in my mind, which is crucial to placing an argument in your overall structure. There's no substitute for hard work, not even raw talent. To non-mooters, you're missing out. There's no other feeling like standing in front of a mirror and pretending to be James Crawford arguing before the ICJ. Nisha: Mooting is definitely something everyone should try at least once. I think it gives young lawyers a completely different skill in research, drafting and teamwork. Sanika: Mooting has become a way of life for me, and it is something that everyone should try at least once in their lives. It is a lot of hard work but it’s all worth it in the end. I have learnt more through moots than in the classroom in the past 2 years. We thank you for your time. Wish you all the very best for the World Championship Rounds.